Detroit, Michigan, August 24, 2017- SER Metro-Detroit, Jobs for Progress, Inc., was awarded a U.S. Department of Labor grant in the amount of $1,100,000.00 to provide opportunity youth ages 18 to 24 years old with basic skills/academic and occupational skills training in the construction field. SER offers the training for this grant through the SER YouthBuild Construction Institute(SYCI), which has received funding from the U.S. Department of Labor for the past ten years to operate this program. SYCI which received funding from the U.S. Department of Labor for the last decade with over 260 graduates of the program. Additional highlights from the Department of Labor funded program include; 236 individuals completing their GED’s or receiving construction certification and 70% of individuals increasing their literacy levels within the first three months of participation. 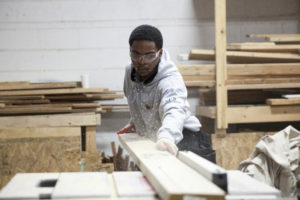 SER YouthBuild has maintained more than a 70% placement rate and has successfully placed 62 individuals in the construction trades and apprenticeships. With the renewal funding, SYCI will train nearly 70 Detroit youth who will receive a GED or High School Diploma and industry-recognized credentials necessary for in demand occupation. The training will contribute to the millions of open jobs in the U.S., including 228,000 in construction, and 388,000 in manufacturing. “SER YouthBuild Construction Institute provides opportunity, a career pathway, education and a commitment to leadership development that can alter the trajectory of our participant’s future,” says SER Metro-Detroit President and CEO Eva Garza Dewaesche. The SER YouthBuild program has maintained a long term partnership with O’Brien Construction to complete on-the-job training opportunities at local housing projects. Participants will also be active AmeriCorps participants during their time in the program and will work towards a $1,500.00 education award for post-secondary education. Over 40 have received the award and continued to college since programming began in 2010.